We all have a comfort zone where we feel safe, happy and satisfied. If we are about to step outside and see the risk of failing that’s when we feel uneasy. It may be something we find hard to understand, something we have difficulty seeing ourselves achieve or all sorts of other different reasons. By constantly dare to step over the edge of our comfort zone, we dare to confront our sense of discomfort that want to draw us back into the safe zone where everything feels comfortable. If you see it from a child’s perspective, life is a constant struggle. To dare expanding the comfort zone by constantly being in new situations, learn new things and deal with new expectations. There are many expectations that come from outside and no child has control over. This is where I believe me parents come in. My role is simply to guide my children to give them the ability to respond to their feelings of anxiety, stress, fear of everything new. Yes everything that creates discomfort and makes them want to take a step backwards instead of forwards. With that ability to move foward they can choose the direction to take. How do you think a child who wants to take a step backwards instead of forwards react? In today’s society we often talk about diagnoses in many direction. For 20 years I have been living near people with different diagnoses. I believe I have seen a common denominator. The ability to manage their own perceived stress and feelings of discomfort creates a certain way to act. Many times it is those actions we choose to diagnose. By being there and helping my children over and over again defy their fears, I slowly but surely build their life experience and get them ready for adulthood. My oldest son can be seen as an absent-minded and headstrong kid with bad memory driven strongly by his own motivation. He may find it difficult to do anything he dislikes which can result in that he is reserved. One day I asked him to tell me about a book he just read about. He began fumbling with a few words. I was prepared to have to ask for more information to find out more. But then suddenly he took, he was right in a sentence, a deep breath. Since then the words flowed better. After a moment of silence, he took another deep breath and the story continued even longer. I sat there and listened to him talking surely for 5 minutes what the book was about. I was completely amazed. You, I asked. I noticed you breathed deeply. Why? Well, it makes me calm. I can think better and it is easier to remember what to say, he said. Finally!! I thought. He had finally found a way to deal with fear to talk to others and helped himself to focus. By helping them manage their feelings about themselves and their surroundings they dare to go forward. It is the foundation in my goal as a parent to give them the ability daring using their own motivation and abilities to reach their dreams. Im curious about you. 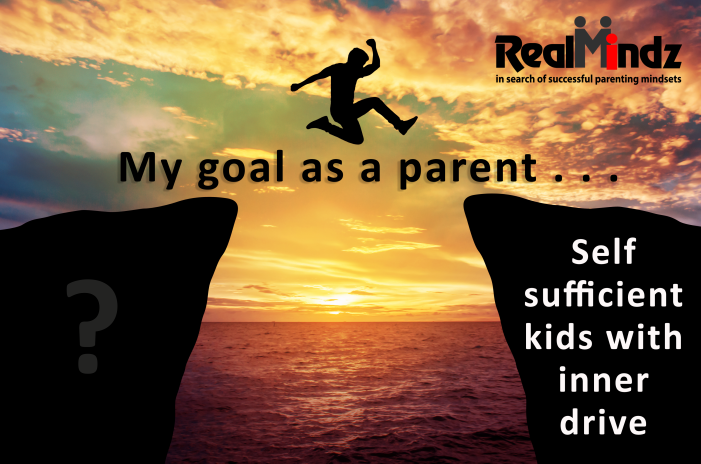 What is your goal as a parent? Write a comment or send me a mail. This entry was posted in CHALLENGE, CONTINUOUS LEARNING, Johan Wiklander, mindability strategies for parents, self sufficient kids ready for life and tagged comfort zone, emotional experience, father, parenting, personal growth children.